Fing’s tale, set in 1937, has an almost mythical feel yet her world is anchored in reality. As Fing’s family struggles to survive ‘the Dad’s’ endless incentives that lead to financial ruin, threads of the past ensnare them. Meanwhile, little sister Muulke pushes Fing to help her find 'tragical tragedies' around them and to their surprise, they do just that. The family is forced to move (out of financial necessity) into a house that is far from town. Despite disasters and insurmountable odds, the house, which is nine open arms long, feels like coming home for more reasons that Oma Mei is prepared to let on. As the family’s quirky way of living plays out, unanswered mysteries thread through their lives. As questions build, answers come from both the past and the present. I laughed out loud, sighed with shared regrets and then Nine Open Arms took my breath away. 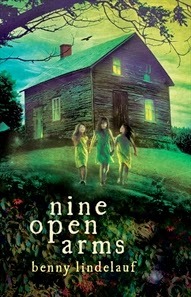 If you loved The Book Thief, then Nine Open Arms is for you. With its easy read and conversational tone, Fing will keep you hooked.